2 or more: $67.89 ea. Protect yourself from excess heating and cooling costs with this Honeywell universal AC/heating thermostat lock box from Today's Concept. 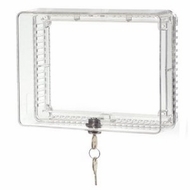 This unique Honeywell AC lock box features a clear plastic cover along with a heavy-duty key lock for ultimate protection. Perfect for the home or the workplace, this Honeywell air conditioner lock box prevents family members, employees or customers from tampering with your thermostat settings and costing you more in energy expenses. Fits all Honeywell thermostats and many thermostats built by leading manufacturers. Ultra acrylic plastic resin cover resists yellowing from UV light for a clear, attractive cover. Key lock prevents unauthorized tampering; thermostat lock box includes two keys. Pre-cut back slots for HVAC wires ensure easy installation.